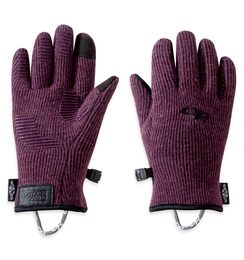 Knit base layer glove with an added slip-on soft shell mitt complete with a water-resistant stretchy, windproof fabric. We know from years of climbing in soft shell jackets that sometimes all it takes to stay warm is a layer of the right material. We applied that idea to the Overdrive Convertible Gloves, with a 3-layer 4-way water-resistant stretch soft shell mitt that slips over a knit glove. 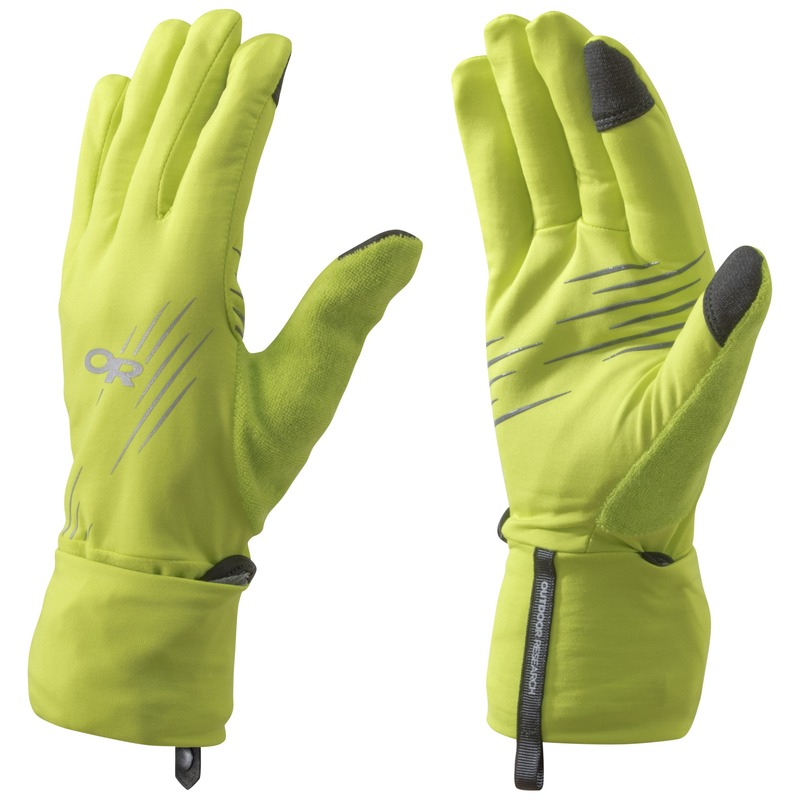 The windproof overmitt includes the thumb, and tucks away into the wrist when you’re not using it. I've only just discovered OR, but I LOVE everything I've ordered! The merchandise came fast, exceeded my expectations and is FUN to wear and use. I got a large. The gloves fit OK but when I put the mitt overtop, my hands are a bit scrunched. I like the concept of them and will use them lots. Close, but could be better. I use this running - similar mit/glove combos by other brands (Nike) have away to secure the wind flap when you don't need it. Instead, it just flops about on these. Gets in the way. Would be 5* if they had an elastic pouch to secure the wind flap. 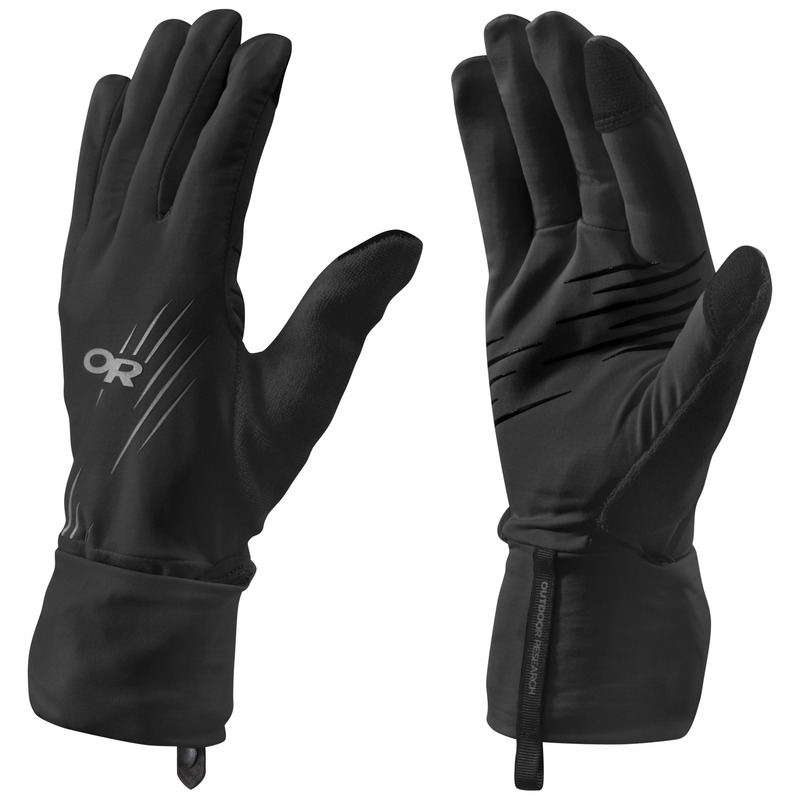 Awesome gloves that work for a wide range. These work great for jogs in cool to cold conditions! I wouldn't use them much if you're going to be holding anything as I'm not sure if the material would withstand a whole lot (ski poles, dog leashes, etc.) But work great for what I'm using them for. Nice to tuck or untuck fingers depending on how chilly it is or if your hands start sweating. I got these gloves to replace a light pair of running gloves (from a different company) I had for years. These have excited my expectations and left me wondering how OR keeps crushing it with every glove I get from them. These gloves were bought for running but I keep packing them on everything from back country trips and ice climbing to Snowmobiling and walking the dog! 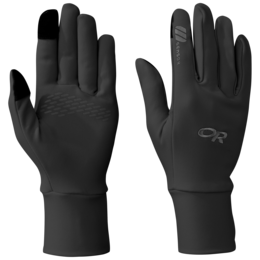 Pros: The under glove is super light weight and provides outstanding dexterity while keeping your hands from overheating. 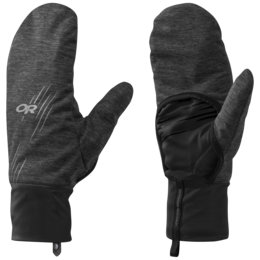 The over mitten is warmer and allows you to layer down when warm or moving and layer up when stopped or temps start to drop. I got the Gray and Yellow version for some added visibility for running in the winter with shorter days. This is the perfect weight glove for activities in cold weather. Cons: I like the high vis options but wish the bright under glove was matched with a black mitten. Also I wish there were grips on the underglove to help keep a hold of things. Recommendations: Just one small tip; the top of the wrist acts as a pouch for the mitten when not in use. With the mitten extended or with mitten in the pouch I use that space for gels (and trash from the gels). It actually works really well and cleans up fast. Being unisex if I were to buy these again I might get one size smaller. Have worn these hiking and boat camping. If the temp drops below freezing these would not be enough on their own but do fit under down mittens. Hand warmers fit nicely in the convertible mitt part! I'm excited to use my new gloves. 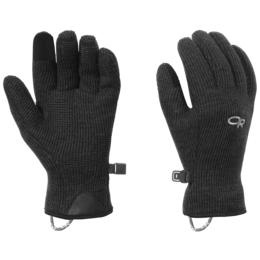 They won't be warm enough for freezing cold and wet days, but very useful when I need the use of my fingers for gear handling, yet the warmth of a mitten and water resistant. Great for cold days while keeping heartrate up. I put a hand warmer in the mitten part and it stays pretty well, then I can use the finger part to mess with gear without exposing skin, and when I put mitten back on it warms my fingers. These are great liners! I bought them to use for winter running and cross country skiing. Well, got them right before heading to Indian Creek for Thanksgiving thinking I'd not need to break them out. Was I wrong! It was so cold there over this past weekend and I was so thrilled with how warm these glove/mits kept my hands in the midst of wet and snowy conditions in Indian Creek. Now that I'm back in Wyoming, looking forward to putting some even more weather miles on these guys! 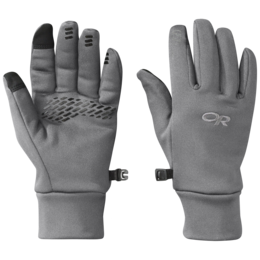 I use these for spring ski touring and Nordic skiing. Very lightweight and thin protection without the mitt covers- which I like for warmer days. When the wind gets chilly or it's time to descend, the mitts add some wind protection. I am in between on sizes for gloves. Should I go up a size or down? Are the thumb and forefinger touch-screen compatible? HI Sebastian, yes, the thumb and index fingertip is touch-screen compatible. Thanks for contacting OR!